28 July 2017, Singapore – Race promoter Singapore GP is offering a host of exciting experiences to get Singapore residents revved up for the 2017 FORMULA 1 SINGAPORE AIRLINES SINGAPORE GRAND PRIX. As part of the annual ‘Rev up Singapore!’ campaign to engage local fans, Singapore residents are invited to go on exclusive behind-the-scene tours and ballot for free passes to walk the Formula 1® Pit Lane or catch a preview screening of Disney/Pixar’s ‘Cars3’. The Thursday Pit Lane Experience is back for its fifth edition. Usually accessible only to Formula One Paddock ClubTM ticketholders over the race weekend, members of the public can enjoy this coveted experience a day before the Circuit Park officially opens to ticketholders. 3,000 members of the public will get to walk the Formula 1® Pit Lane on Thursday, 14 September for an exclusive up-close view of the race cars and the pit crew in action at the team garages. Visitors will also enjoy performances from roving artistes, try their hand at interactive activities and shop for official merchandise at the F1 Village. Singapore residents can ballot for a complimentary pair of passes from now till 27 August. 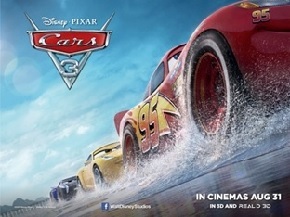 Fans of Lewis Hamilton can catch the Formula 1® driver in the third instalment of the popular ‘Cars’ film franchise. Singapore GP has teamed up with Disney/Pixar to be the first in the republic to present a preview screening of ‘Cars 3’ to 1,000 lucky Singaporeans. The screening will take place at Golden Village cineplexes in Jurong Point, Suntec City, Tampines, Vivocity, and Yishun on Saturday, 19 August, before the movie officially opens in Singapore cinemas on 31 August. Singapore residents can ballot for a complimentary pair of tickets from now till 9 August. 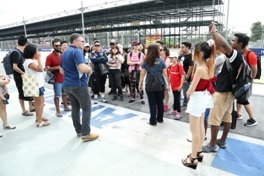 Members of the public are invited to go on a guided walking tour of the Marina Bay Street Circuit and see what it takes to set up the home of Formula 1® night racing. 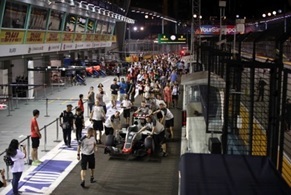 Participants will hear first-hand from key Singapore GP representatives, gain an insight into the inner workings of the Paddock, and access restricted areas such as the team garages, media centre, race control room and the winners’ podium. For the first time, the tour will also feature a part of the Temasek Suite, an exclusive hospitality suite that hosts various dignitaries and foreign ministers of state during the race weekend. Each tour lasts approximately 1.5 hours and costs $5 per participant, with proceeds going to Community Chest. Registration will commence in mid-August. 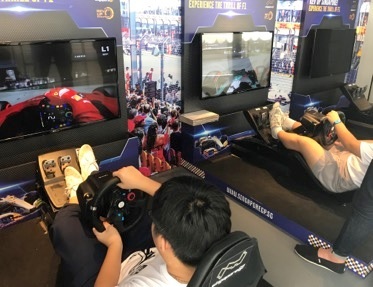 Back by popular demand, members of the public can experience the adrenaline rush of Formula 1® night racing on board Singapore GP’s ‘Rev Up Singapore!’ roving truck. Race around the Marina Bay Street Circuit on simulators for free and take home exclusive premiums. Catch the truck as it makes pit stops islandwide at schools, heartlands, community events and public spaces including Queenstown Community Centre, Our Tampines Hub and Punggol Park from now till September 2017. Organisations who wish to have the ‘Rev Up Singapore!’ roving truck at their event can write in to revupsg@singaporegp.sg with their request. More ‘Rev Up Singapore’ initiatives will be announced in the coming weeks. For more information on Singapore GP’s ‘Rev Up Singapore!’ campaign and to ballot for passes, please visit www.singaporegp.sg/revupsingapore.